Silversea announced that the Silver Whisper will drydock between Dec. 8 and Dec. 19, 2018, for a scheduled refit at Grand Bahama Shipyard ahead of the vessel's 2019 world cruise. 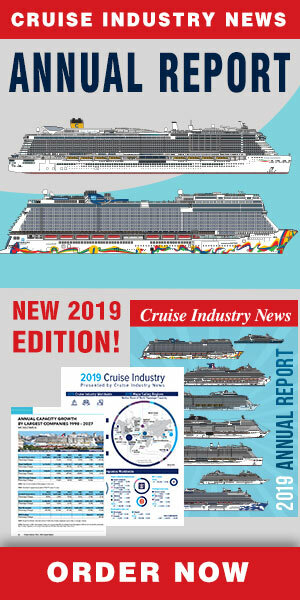 Among the highlights will be storage space for zodiacs and a crane will be installed in preparation for the addition of the motorboats ahead of the ship's 2020 world cruise, which will see the ship travel to all seven continents, the company said. As well, the ship will get a significant interior overhaul, the company said. "The ship’s latest enhancements will be implemented with a similar design and features as can be found on the recently delivered Silver Muse, Silversea’s flagship and on the Silver Spirit which is currently undergoing a significant renovation," Silversea said. "The renovation’s most discernable impact will be made to the ship’s public spaces, which will be redecorated in line with the interior design of Silver Muse. Inside, new carpets will be laid in the hallways, main restaurant, casino, card/conference room, main bar, and in the theatre. The main restaurant will undergo a full upgrade, bringing it to an exceptional standard, while La Dame – another sophisticated dining space – will benefit from new curtains and a polished floor. The casino and card/conference room will also be refreshed with new curtains and new chairs. The Zagara Spa – which was recently introduced to Silver Whisper, following its success aboard Silver Muse ­– will become even more luxurious with new furniture and new equipment. In the ship’s gym, new state-of-the-art machinery will be installed to optimize the offering of onboard wellness facilities." Nine Terrace suites on deck five will be transformed into Veranda suites, offering guests enhanced privacy; 40” flat screen televisions, loaded with innovative interactive media systems, will advance the in-suite entertainment options; and all bathrooms will be revitalized with polished granite surfaces.